Next to your Multivitamin and Fish Oil, probiotics are right up there on your must have list regarding your supplements! 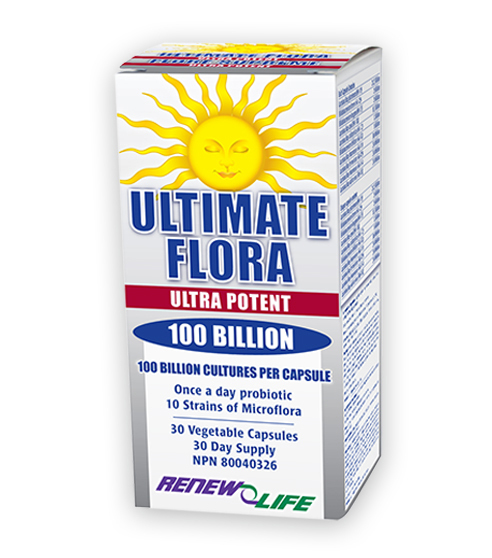 Renew Life’s newest probiotic is their Ultimate Flora Ultra Potent 100 Billion. 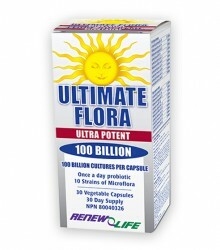 An unhealthy gut causes all kinds of health problems so protect yourself with Ultimate Flora Ultra Potent 100 Billion. Renew Life carries a number of different probiotic formulas. To verify if Ultimate Flora Ultra Potent is the best formulation for your condition, please view their Probiotic comparison chart. Ultimate Flora Ultra Potent is the strongest probiotic single dose allowed in Canada delivering 100 billion beneficial bacteria to the digestive tract! It is ideal for people with severe digestive issues, who have been on multiple rounds of antibiotics or are just looking for the most potent probiotic formula available. All Renew Life Ultimate Flora probiotics are enteric coated to ensure delivery past the stomach acid and the potency is guaranteed at expiry. Every high potency, multi-strain formula is developed with optimal digestive health in mind making them the best probiotics available. My naturopathic doctor recommended Ultimate Flora Ultra Potent because I was on antibiotics. I had taken probiotics before while taking antibiotics and they hadn’t worked to prevent yeast infections (I am VERY prone to yeast issues). She said that the particular type of probiotics in Ultra Potent were chosen because they were not killed by antibiotics. Sure enough I didn’t get a yeast infection! I think I will continue on this and see what other great things happen. Kendy ACTI Flora+ is the Ultimate Probiotic and Prebiotic which = Synbiotic!